In the heart of the Kologha Forest lies a little haven where man and nature seemingly live harmoniously together in a little piece of Utopia. The Kibbutz is run by a family who practice subsistence farming and invite guests from around the world to join them for an unforgettable stay. But above and beneath the surface lies another world that reeks of death and evil. 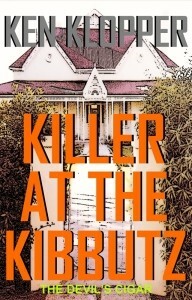 Will guests, Harish Ramkissoon and Sue Mitchell, uncover the mystery of the missing guests and unmask the Killer at the Kibbutz? I wanted to create a plot with multiple characters that was fast-paced and retained the tension throughout the story-line. I set it in a rural area known as the Kologha Forest near a town called Stutterheim in the Eastern Province of South Africa. My characters came from places around the world and from the local community. I tried to make them diverse and controversial. The story has a rather dark setting and many of the characters have traits that are questionable in order to create twists in the ‘whodunit’ plot. “I’m Cristal . . . Cristal Lotts . . . and I’m not so little . . . I’m six.” She held up the fingers on one hand and one finger on the other. She seemed satisfied with his explanation. She gave him a puzzled look, shook her head, and then decided that it was safe to sit beside a featherless Indian. She slapped her knees. “I’ve been feeding the pigs,” she said.